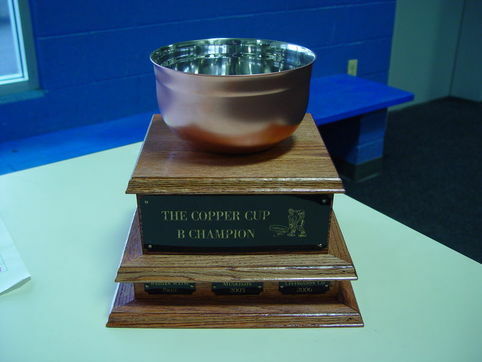 The Copper Cup Hockey Tournament started out in Birch Run, Michigan as a tournament for police, fire and corrections to compete on ice for the Copper Cup. The tournament was moved from Birch Run to Bay City, then to Flint, and continued in the same format with some slight modifications. The tournament found its new home in west Michigan in 2004, and now it is back to Bay City. The tournament has returned to the original format of strictly First Responders and Military. The proceeds from the Copper Cup Hockey Tournament benefit the Law Enforcement Torch Run for Special Olympics Michigan. In the past couple of years, the tournament has raised thousands of dollars for LETR, and this year expectations are set higher. LETR raises money and awareness for Special Olympics so over 23,000 special athletes can compete in a variety of events at no cost to them or their families. For more information regarding Special Olympics and the Law Enforcement Torch Run check out www.somi.org. A Division - for the highly skilled teams with former high school, college or junior players. B Division - for competitive players with prior organized hockey experience. Gentlemen Division - for players with limited or no prior hockey experience.